Halloween isn't celebrated in Australia like the US and in the 15 years I've lived in my house I've not had a trick or treater until 2 years ago - about 4 lots of them! I was extremely embarrassed when I had absolutely nothing to give them - not even BBQ Shapes. So last year the girls and I got busy and made some cute little packs up. Guess what? Not one trick or treater came. The girls had lolly bags in their lunch boxes for weeks after. Regardless, I will not be left with a small child standing at my door with the look of disappointment ever again! 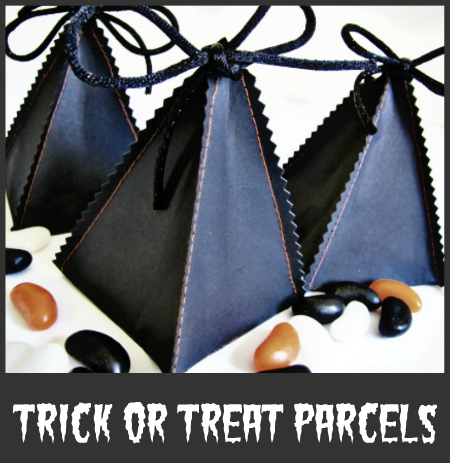 Here are the instructions to make these cute little treat parcels out of poster paper with a sewn edge. 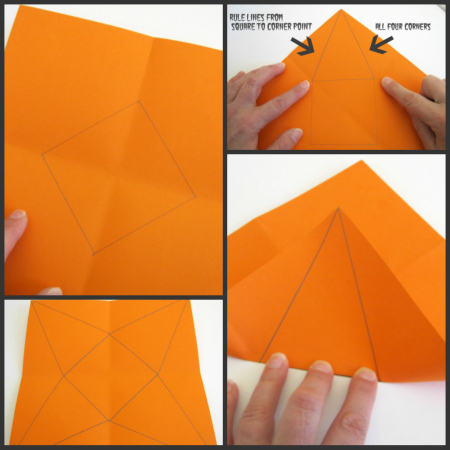 Take a single square and fold in half but only crease the ends like the above image. 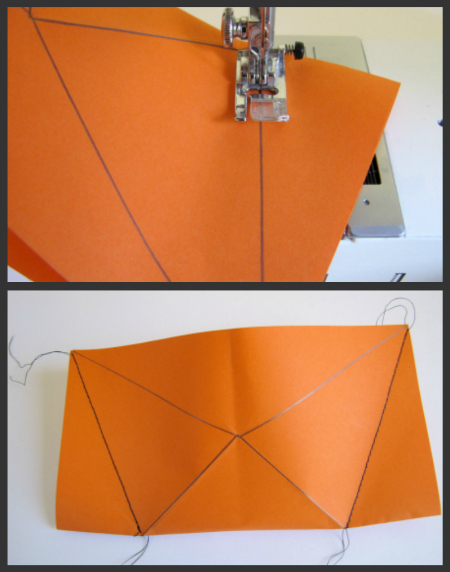 Then fold the other way so all four sides have a small crease. Follow each crease and place (not a line) a mark at 5cm. I am using pencil for this example so you can see it but I would recommend just scoring the paper with something pointy like an unpicker. You don't want any markings visible. Once you have your four markings, join them to make a square. This will form your base. As shown in diagram in the top right hand image. Draw two lines from the square to the corner point to form a triangle. Repeat for all three other corners and your pattern should look like this. With your finger, fold a crease along each four side lines of the base. 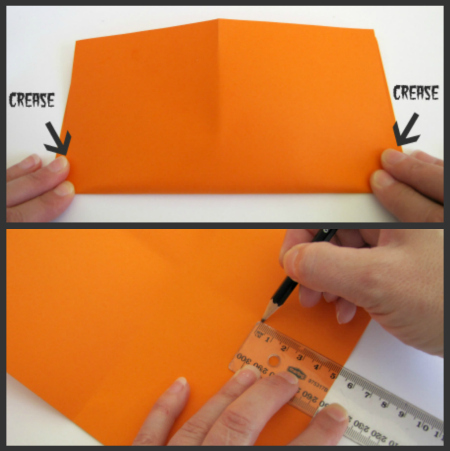 Fold your paper in half without forming a crease. Push the ends to meet in the centre and it will start to form the correct shape. Matching the two lines you have scored, sew your third side seam. It will be tricky. I haven't shown it here but using a zipper foot attachment will help a lot. 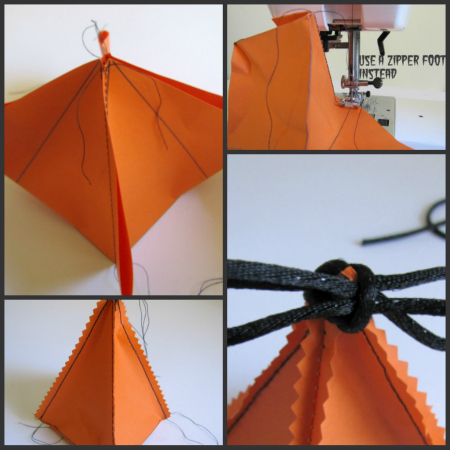 You will not to able to sew without folding the paper so make sure it's the base that gets most of the folding as the weight of the treats will straighten it out. Add your treats through the one side that is left open. Again matching the lines you have marked, sew the final side closed. Hide the top with a ribbon bow. Brilliant! And... what you didn't even have any apples to give them or maybe a wrinkly potato from the bottom of the spud drawer?? haha - I think I was in shock as I'd never had any before.